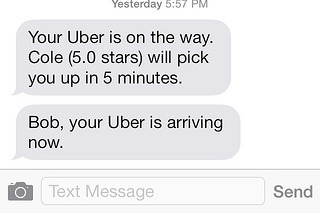 There is some evidence Uber’s surge pricing is improving taxi markets. The firm says drivers are sensitive to price, so that the temptation to earn more is getting more Uber drivers onto the roads at antisocial hours. In San Francisco the number of private cars for hire has shot up, Uber says. This suggests surge pricing has encouraged the number of taxis to vary with demand, with the market getting bigger during peak hours. However, the inflexibility of Uber’s matchmaking fee, a fixed 20% of the fare, means that it may fail to optimize the matching of demand and supply. In quiet times, when fares are low, it may work well. Suppose it links lots of potential passengers willing to pay $20 for a journey with drivers happy to travel for $15. A 20% ($4) fee leaves both sides content. But now imagine a Friday night, with punters willing to pay $100 for a ride, and drivers happy to take $90: there should be scope for a deal, but Uber’s $20 fee means such journeys won’t happen. You seem to be confusing the uber driver's profit (net of uber fees) with the price he would have been willing to accept. There isn't a single Uber market. They started with sedans and other forms of private cars for hire, but they also have moved into the public taxi space. In New York and some other cities, I can call a regular public taxi where I pay the legislated rates directly to the taxi rather than stepping out of the private car while Uber takes care of everything. In the private car area, I've had plenty of Uber drivers tell me they were on their way home and decided to take a me as a last fare. That seems reasonable since they are probably betting it's an airport run. They don't have to give me a ride, even if they will stop if I flag them. Public taxis (like the green or yellow cabs in New York) are supposed to accept any fare (that they don't pick up some people is a different issue). They don't know get to choose. With UberT, I'm surprised that on busy nights I can get a taxi when all the others appear engaged. A driver will turn around and drive five minutes to get to me despite hordes of people trying to flag him. Once he gets to me, he kicks out people who try to steal the ride. They'll do all this even though they don't get to charge any more. There's something else going on besides surge pricing. TAXI MARKETS ARE DRIVEN BY RACISM NOT EFFICIENCY. What about the ethics of taxi markets? Why is it that people stop thinking about ethics when taxi markets are discussed? Are people really blinded by racism or greed? I used uber for the first time just last week. During the ride to the airport, I had a great conversation with the driver regarding uber. He absolutely loved uber. The biggest advantage to him was the reduction in gas expenses. He said that prior to uber, gas took 20% of his revenue, but now, only 10% of his total revenue is needed to cover gas prices because he was picking up clients that were close to him at that time. He also loved the fact that he was his own boss and didn't work for a company that mandated his hours and vacation time. He decided those on his own now. I couldn't help but feel really happy for this man, who had come to America for a better life and was now running his own business and telling me how excited he was because he had just purchased an escalade so he could earn even bigger fares .